San Diego’s Chinatown began in the area in the 1860s settled by abalone fishermen. The area was once a thriving Chinatown full of Chinese and Chinese-Americans who were not allowed to live in other sections of the city. However, the area no longer has an especially large Chinese or Asian population. After the repeal of the Chinese Exclusion Act in 1943 (which banned them from becoming citizens and owning property), and after returning from service in World War II, Chinese-Americans moved to other areas of San Diego. 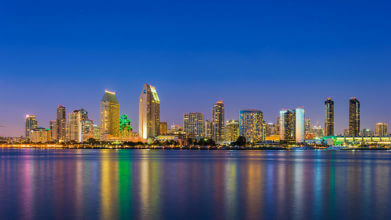 The City of San Diego designated the area a historic district in 1987. The San Diego Chinese Historical Society was formed to rescue the Chinese Mission building. Built in 1927, the Chinese Mission Building served as the home of the Chinese Community Church in the historic Chinatown of San Diego. The church building was moved into the Asian Pacific Historic District on Third Avenue and renovated into a museum with an Asian koi pond and garden. The museum’s exhibits share the heritage of San Diego’s Chinese community and the essence of Chinese arts and culture. Artifacts are on display in rotating exhibits housed at San Diego Chinese Historical Museum’s three buildings: Chinese Mission Building, Dr. Sun Yat-Sen Memorial Extension, and Chuang Archive & Learning Center. All of the buildings are located in the Asian Pacific Historic District.